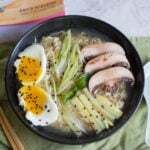 This Instant Pot Tonkotsu Ramen is perfectly portioned for two and is delicious until the last slurp! 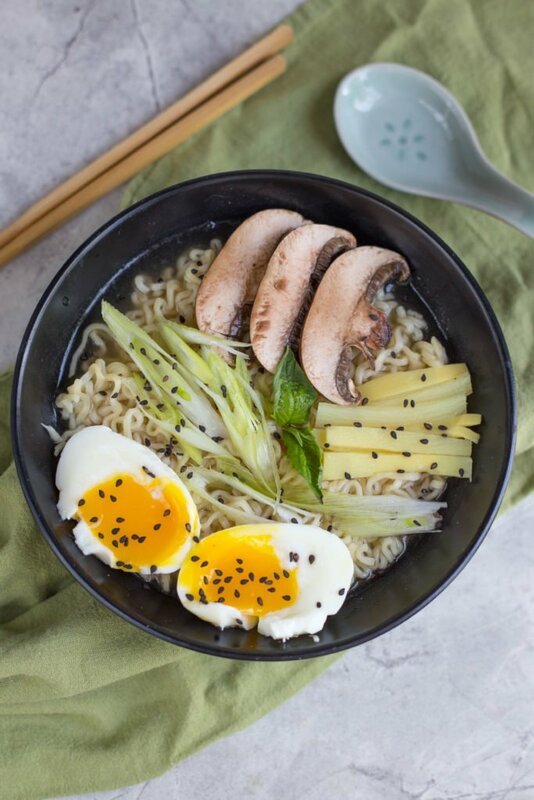 Tasty ramen noodles swim in a rich, silky broth topped with hearty mushrooms, crunchy bamboo shoots, bright spring onions, and a yolky soft boiled egg. 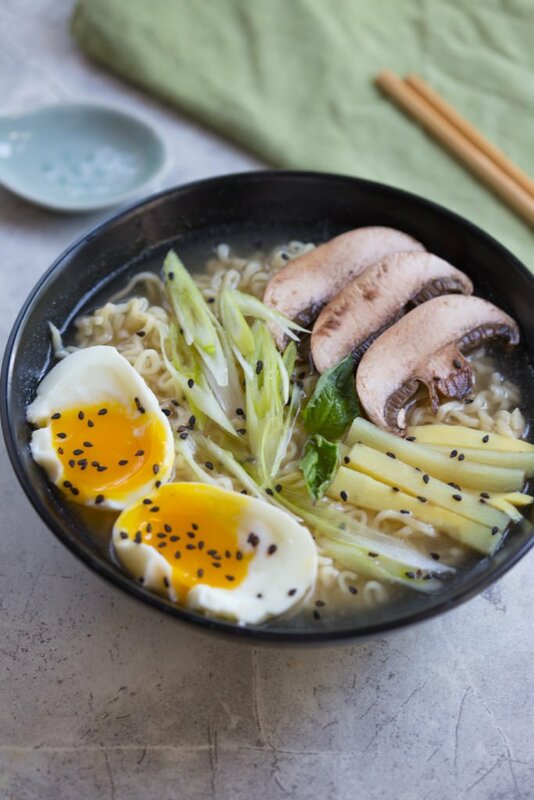 Instant Pot Tonkotsu ramen noodles are so much better than the ones you had in college and are an amazing and flavorful meal to have after an eventful day in the sun. I adore a piping hot bowl of comfort after a long hot day at the beach or pool. Being out in the blazing heat then walking into a blasting A/C will absolutely chill you to the bone. And what about the sunburn chills? Have you ever had those? Like, it’s kind of unreal. You’re literally sweltering hot, but freezing cold at the same time. Chill bumps and all! Luckily this Instant Pot Tonkutsu Ramen remedies those chills likety split! This gorgeous recipe was made from the cookbook written by my friend, Erica, at The Crumby Kitchen. 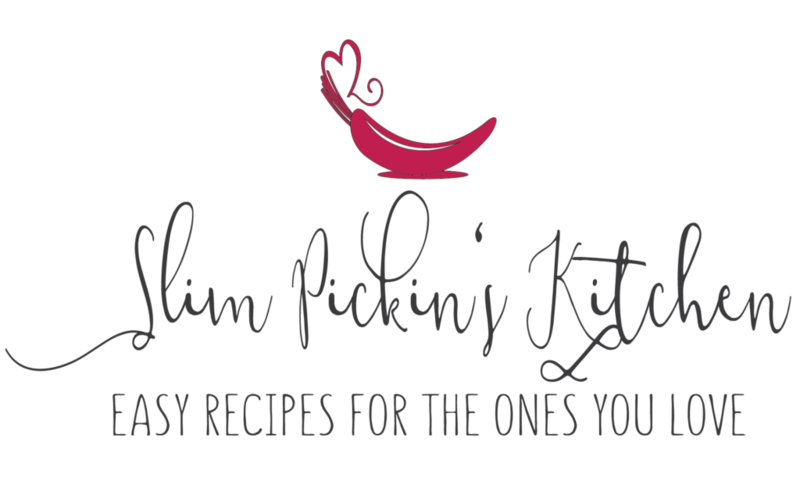 She has developed 120+ easy, perfectly portioned recipes for the electric pressure cooker and multi-cooker that are just like your favorite family recipes, but made in smaller quantities. Electric pressure cookers are all the rage right now in the culinary world, and I can assure you it’s for good reason! Pressure cookers can put a meal on the table faster than a hot knife through butter and, when paired with The Electric Pressure Cooker Cookbook for Two, clean up is also quicker b/c you don’t have to worry about leftovers! 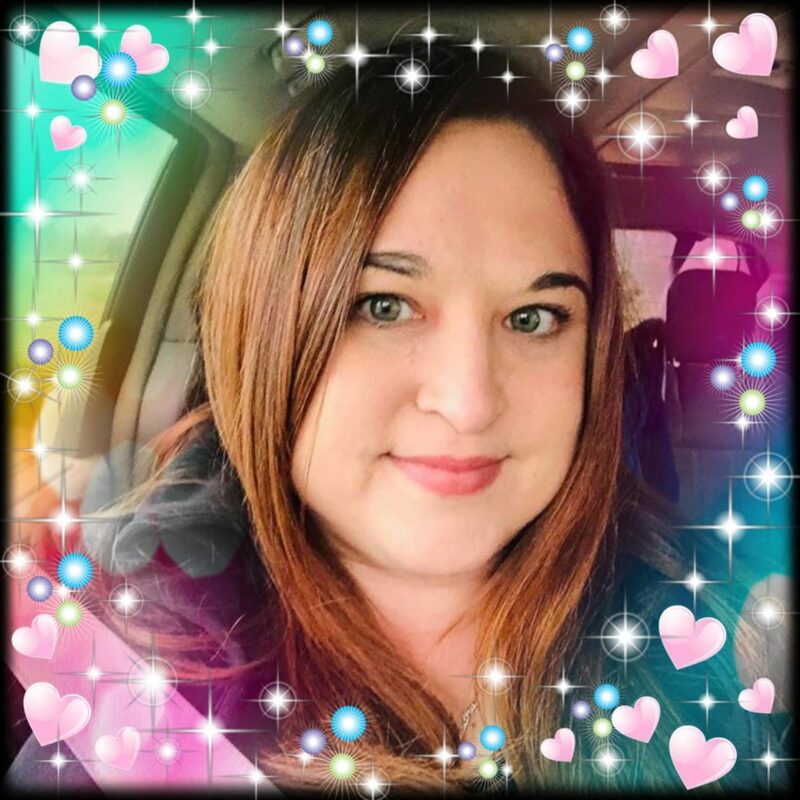 From meals like this Instant Pot Tonkotsu Ramen to Biscuits w/ Sausage Gravy to Broccoli Cheddar Scalloped Potatoes to Flea Market Kettle Corn, Erica’s cookbook recipes range from on-the-go breakfasts to desserts that cook while supper is being enjoyed. 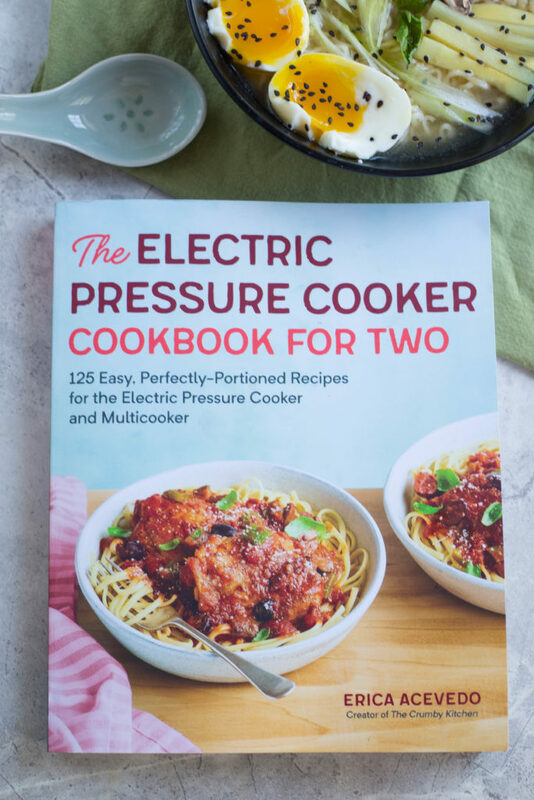 The Electric Pressure Cooker Cookbook for Two is a win all around, and is available for sale through Amazon.com, Barnes & Noble, Books-A-Million, Indiebound, iBooks or anywhere where books are sold. But guess what!!! Today, I’m giving away a copy of this gorgeous book FOR FREE!!! Want to win your own copy of The Electric Cooker Cookbook for Two? All you have to do is leave a comment on this blog telling me about your favorite meal after a long day in the sun, and you’ll receive major bonus points if you follow us both on Instagram, Facebook, and Pinterest. P.S. The recipe for the Instant Pot Tonkotsu Ramen is below the giveaway sign up! for 10 minutes with the lid loosely covering the pot. transfer them to a large bowl of cold water, and remove any fat. Rinse the cooker pot, dry it thoroughly, and return to the cooker. 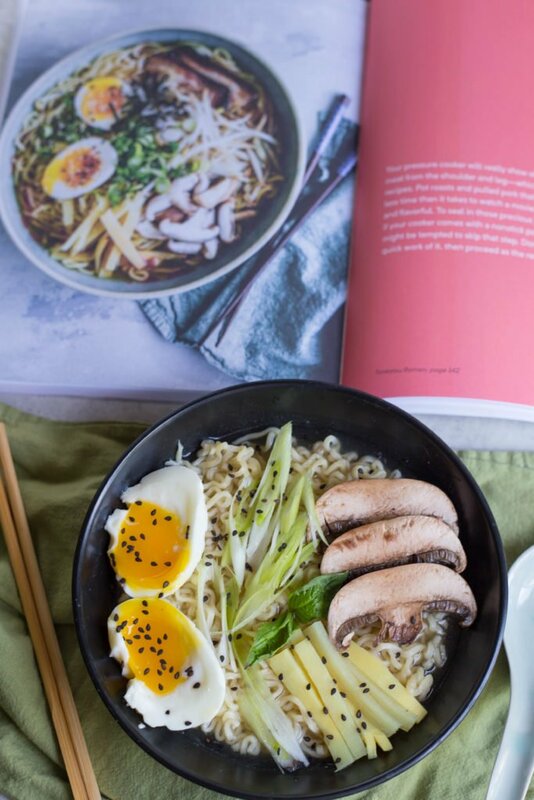 Serve w/ chashu pork belly or bacon, mushrooms, scallions, bean sprouts, bamboo shoots, sliced seaweed, soft boiled eggs, and a sprinkle of sesame seeds. Shrimp salad, sliced heirloom tomatoes, and a bowl of SC peaches with vanilla bean ice cream! 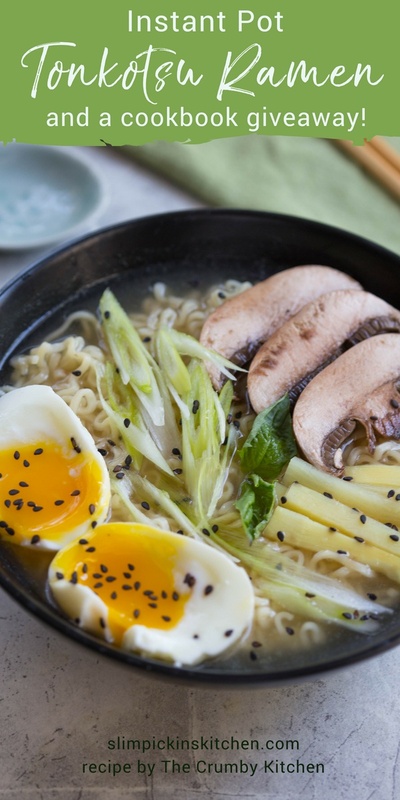 I love sprucing up ramen into a tasty, filling meal with all kinds of veggies, meat or other condiments. Thanks for this delicious recipe!